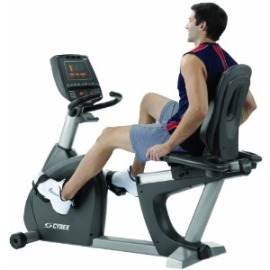 The commercial Cybex 750R recumbent exercise bike offers three styles of resistance with a wide range of 20 to 900 watts. From advanced athletes to out-of-shape newbies, there’s no other recumbent on the market that serves as a complete cycle machine for all users. With three modes of operation and 9 programs with 21 levels, the split level amber display on the Cybex 750R recumbent exercise bike is simple to use and well laid out. 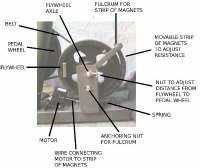 In the Bike mode, choose Quick Start or Manual. In Constant Power mode, choose among the 9 programs including Heart Rate Control workouts. 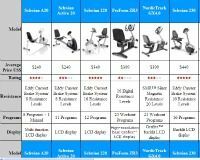 In the Isokinetic mode, choose from among Manual Isokinetic Mode, YMCA Fitness Test, and 9 custom programs. The Cybex 750R recumbent exercise bike has a self-tensioning single-stage drive, a hybrid eddy-current brake with a brushless internal generator providing high torque, low drag, and smooth performance. The step-through design makes entry and exit very easy for users of any size. The side-mounted handlebars by the seat have contact heart rate grips to provide convenient heart rate monitoring. 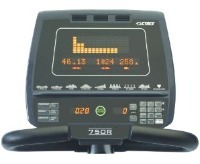 The Cybex 750R console layout is beautiful: the large LED graphics display shows distance, calories, calories/hr, METs, Watts, RPM, and heart rate on the upper display; the lower display shows time, speed, and resistance level. For wireless HR monitoring, you can purchase an optional chest strap. The three modes of resistance include Bike Mode, to simulate the feeling of riding outdoors, Constant Power for the 9 programs in which the user pedals at a desired speed while a consistent workload is maintained by the bike, and Isokinetic mode, in which the user keeps to a set RPM and the bike selects the resistance. If we were going to spend $2,499 on a premium recumbent exercise bike, the Cybex 750R would be the one we would buy. If money is no object for your home gym, or if you are ordering this unit for your facility or clinic, then the professional grade Cybex 750R recumbent exercise bike is the best. It delivers the superior comfort, reliability, durability, and performance for heavy use all day every day. It is an excellent cardiovascular trainer that reflects the company’s long heritage of applying exercise science to rehabilitation equipment.